One of the worst things to get on your carpet is anything that is sticky. 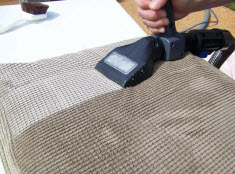 Unlike a liquid spill the stickiness attaches to the carpet fibers and the smallest amount of movement will end up making the item stick even more. You may assume that you are out of luck if you have a child drop a sticky candy or someone loses a piece of chewed up gum on your carpet or rug but you can remove it. There are treatments that you can try that are able to remove the gum and save the rug or carpet. The best solution to remove a stain on your carpet or rug is to call a carpet cleaning professional that can come out and treat the area and clean the carpets for you. Their expert knowledge in stain removal is invaluable and can help to save your carpets from further damage and leave them looking their best. If you are interested in trying to remove the sticky gum or candy on your carpets yourself there are a few options you can choose from. Leading Carpet Cleaning lists a few ways you can remove gum or sticky candy from your carpet. You Can Use A Bag Of Ice to Remove Gum & Sticky Candy from Your Carpet: However the sticky substance got on the carpet doesn’t really matter. You need to be sure that you take care of it as soon as possible. If you notice an area that has gum you can go get a few pieces of ice and place them in a bag. Sit the bag on the area that needs to be treated and let it sit for a few minutes. The goal is to freeze the sticky mess so that it can be chipped away with a hard item such as a knife. Once it is frozen you can chip away at the area and pick up any of the substance that you can get off. You Can Use Oil or Peanut Butter to Remove Gum from Carpet: Just like your mom used to get gum out of your hair, the same method with a scoop of peanut butter will work on your carpet too. You can use straight oil or peanut butter that is a little easier to keep under control. You must be careful with this method since the oil can leave a secondary stain on the carpets. Take some peanut butter and work it into the gum. This will break down the gum and allow it so that you can remove the pieces from the carpet fibers or rug. Call Leading Carpet Cleaning for all your floor and upholstery cleaning needs! If you have gum or sticky candy stuck in your carpet give Leading Carpet Cleaning a call today in Orange, Santa Ana, Rancho Cucamonga, Anaheim, Whittier, Riverside, Chino & Fullerton California today. If you have a furry friend that lives in your home, you probably have suffered from pet stains that also lead to pet odors. They are not fun to deal with and be extremely difficult to treat. May times our furry friends find a spot that is hidden or out of reach to do their business and it isn’t until later that we even find it. The longer it sits the worse the stain and the odor will become and the harder it will be to remove them. There are some remedies that you can try to remove these stains and at the same time treat the odor but the best way to treat these areas is to have a professional carpet cleaner come out and clean your carpets and rugs for you. Leading Carpet cleaning lists ways you can try to treat the pet stains and odors in your carpets and rugs. Baking Soda, Water & Vinegar Carpet Stain & Odor Removal: If you want to use something that most people have in their home on a regular basis, this is a great solution for you. Baking soda is used as a way to reduce smells in many areas in life and your carpet is just one. The diluted vinegar mixed with the baking soda also acts as a oxygenated way to pull the stain and odor away from the fibers and the padding so that it can be removed. You need to have a spray bottle handy that you can use for this solution and be sure that you label it so that it is not confused with water. Take two cups of water and 2 cups of vinegar and mix them together. Then add about two tablespoons of baking soda to the mixture and put it in the spray bottle. You can use this solution to saturate the areas of the carpet that need to be treated. Let the solution sit for several minutes then dab away the solution and the stain with a clean wash cloth. The area should be clean but if not you can re-do this application. Call a Professional Carpet Cleaner: If you want to feel much more confident in the stain and odor removal it is always best to call a professional carpet cleaner to take care of the problem for you. They will be able to use an industrial strength cleaner and a vacuum that will work best to eliminate the odor and treat the stain at the same time. Leading Carpet Cleaning offers full service carpet cleaning and pet stain and odor removal in Orange, Santa Ana, Rancho Cucamonga, Anaheim, Whittier, Riverside, Chino & Fullerton California. What Are the Benefits of Professional Carpet Cleaning on A Regular Basis in Anaheim CA? If you are like many homes across the United States you have carpet in some of the areas of your home. Carpet is a great option for bedrooms and family rooms where most people choose to relax and rest. Carpet is intended to keep well for several years only as long as you take care of them. This mainly means making sure that they are kept clean. This includes vacuuming and having them professionally cleaned on a regular basis. The carpet is made up of fibers that can soak in any spills that end up causing stains pretty quickly. If you have pets that is an entire new level of stains and odors that can cause some serious problems with the carpets and the only real way to take care of it is by hiring a professional carpet cleaner. The carpets can be expensive to replace so taking care of them the right way with professional carpet cleaning will actually save you money. Leading Carpet Cleaning has some benefits of hiring a professional to clean your carpets. 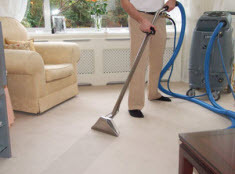 Carpet Cleaning Can Remove Set In & Fresh Stains: If you have ever tried to remove a bad stain such as blood or coffee then you know that it can be terribly hard. No matter the type of stain that you are working with the faster you get to the cleaning up the better your chances are of getting it all the way out. Spills that have set up for some time will need a more aggressive treatment to make sure that they are removed all the way. If you have stains that are set in or even fresh call a professional to come out and clean them for you. Carpet Cleaning Will Leave Your Home Smelling Better: If you are sick of that dusty or musty smell in your home it could be to blame on your carpets. The carpets has dirt and dust that is settling in and causing that smell to permeate through your home. The dust needs to be removed in order for the smell to go away. A carpet cleaning professional can come out and remove the dirt and dust and leaving your house smelling much better. Carpet Cleaning Can Prolong The Life Of Your Carpets: This is a great benefit of professional carpet cleaning. When you have the carpets cleaned on a regular basis the fibers will stay full and clean. This will keep them looking good and prolong the amount of time that you can keep them before paying to have new carpet installed. Leading Carpet Cleaning offer full service carpet cleaning and stain removal in Orange, Santa Ana, Rancho Cucamonga, Anaheim, Whittier, Riverside, Chino & Fullerton California. Hardwood floors are a great option for flooring in any home. Hardwood is a beautiful and easy to care for floor but you need to be careful so they are not being damaged. The floors are normally a natural wood and that means they can be damaged by simple everyday life. When hardwood is installed, the pieces are manufactured with a color and clear coat that helps to protect the floors from normal wear and tear. As long as you are taking care of the floors and having them cleaned on a regular basis and refinished when necessary they can last a long time. There are several ways that your floors can be damaged and that means that you have to have them repaired or refinished more often. Leading Carpet Cleaning lists ways you could be damaging your hardwood floors. Dirty Shoes Will Scratch Hardwood Floors: When you walk into the house with your shoes on, the floors can be damaged. The bottom of your shoes are full of fine dirt that is going to act like sandpaper on your hardwood. Just imagine taking a piece of sandpaper to any piece of wood and it will cause it to be roughed up. The best way to remove this problem is to have a welcome mat on the floor and make sure that you use it. This will help to remove the dirt from the bottom of your shoes and that can save your floors. Don’t Secure Your Rugs to Hardwood Floors: This is hard for most people because no one wants to have their rugs out of place. Try to resist the urge to tac them down with tape or any other adhesive. Let the rug slide when it needs to. This will stop the traction on the rug which can start to wear out the spots on the floors. The other problem with using tape is that when you go to remove it you can possibly remove the finish on the floors. Use The Correct Hardwood Floor Cleaner: This is a big way that floors are being damaged. 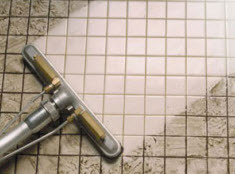 If you are using a cleaner that is all wrong for the floors it could be causing damage to the floors. A cleaner can also take off the finish in the floors which makes them needing to be refinished sooner than the average. If you have hardwood floors that need to be refinished call Leading Carpet Cleaning in Orange, Santa Ana, Rancho Cucamonga, Anaheim, Whittier, Riverside, Chino & Fullerton California today.